We support the aim of the Global Conference on Primary Health Care to renew political commitment to place primary health care at the heart of achieving universal health coverage and the Sustainable Development Agenda and the original principles of the 1978 Declaration. Communities and individuals are contributing pillars to the success of Universal Health Coverage. The Mission Statement of the Alliance is to empower and involve communities to work on measures to improve health through health promotions. Our start was after the Jakarta conference on Health Promotion in 1997 to help bring international declarations to the grassroots level. We, the Alliance and our member societies accept the WHO’s invitation to the global health community to work with the WHO in order to optimize the efforts to meet these aims. Health care resources can be a barrier to achieving Universal Health Coverage and the Sustainable Development goals. There is strong evidence that partnerships with nongovernmental organizations help to define cost-effective measures to promote healthy living and new care models. As such, we are keen to work with you and to share our expertise to further increase the impact of the implementation of the WHO General Plan of Work 13 and especially the universal health coverage priority. Universal Health Coverage has a very wide definition and can be interpreted differently depending on the needs of the community being served. Partnership with and engagement of community leaders, community organizations and grassroots groups will ensure that health is understood by those who need it most. Empowerment of women, early childhood health and addressing mental health are all essential to universal health coverage. We encourage the WHO and UNICEF to look at different models to deliver health care to those who need it most. For example health co-operatives are very effective in many regions as they prioritize the needs of a community. We would like to highlight that financial efficiency and human resource education and support are both required for achievement of these aims. We support the need for healthy living starting before birth, supporting healthy pregnancies, nurturing early childhood development through to nurturing and supportive senior care through to dignity in death. Further we support healthy living with healthy mental health and well being throughout one’s live. Thank you for the opportunity to speak for Alliance for Health Promotion, a global organization representing the views and expertise of health promotion civil society. 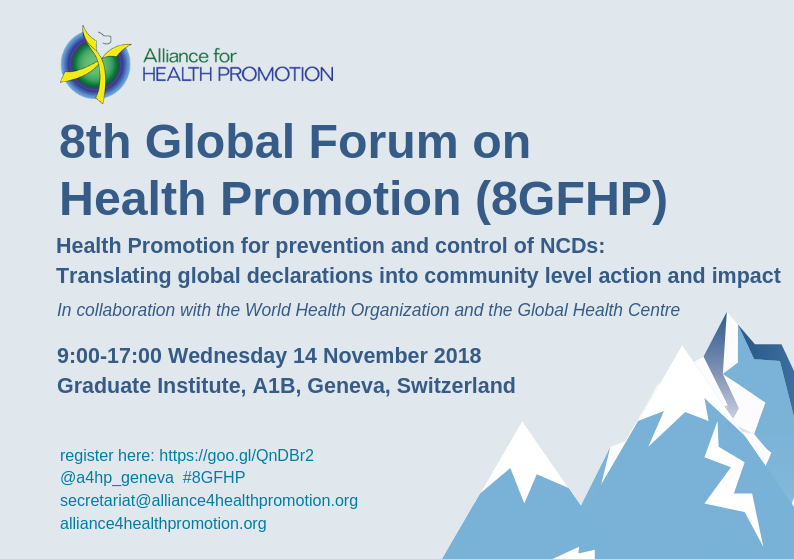 The Alliance for Health Promotion strongly advocates for health promotion strategies that increase the empowerment of individuals to take action by actively promoting health literacy, thus reducing common NCD risk factors such as tobacco use, physical inactivity and poor nutrition. By increasing health literacy through health promotion, individuals and communities are empowered with ownership of knowledge and means to be in better control of their health. This is an effective response to NCDs and underlying risk factors. We encourage all countries to make health promotion a priority at a national level and community level to contribute to the promotion of healthy behaviours, thus contributing to reducing the burden of NCDs. Community wide public education and awareness campaigns are inexpensive but effective health behaviour changing activities and should be a priority for governments. We at the Alliance for Health Promotion have been celebrating Health Promotion Day in collaboration with the local communities since 2015. Such events bring local together with global to raise awareness of health promotion. This year the WHO spearheaded this initiative with the ‘Walk the Talk: The Health for All Challenge’ event. This High-level Meeting on the Prevention and Control of NCDs presents the opportunity for countries to demonstrate their commitment to invest in NCDs programmes and planning. As well, it will strengthen the engagement of multiple stakeholders involved in NCDs-related health action, advocacy, literacy and health promotion. We would like to stress again that a health promotion approach can achieve a great impact in the fight against NCDs. The World Health Organization (WHO) has published worldwide physical activity trends in the Lancet Global Health today showing a lack of progress made in physical activity levels since 2001. If such trends continue, the 2025 global physical activity target of 10% relative reduction in insufficient physical activity will not be achieved. More than 1.4 billion adults worldwide are at risk of developing non-communicable diseases (NCDs) as a result of physical inactivity. The message is loud and clear; there needs to a substantial increase at the country-level to scale-up implementation of effective policies. Policies to increase population levels of physical activity need to be prioritised and scaled up urgently. Community-based campaigns to enhance awareness and understanding of the physical activity benefits (social, economic, and environmental) is one of the 20 policies outlined in WHO’s Global Action Plan on Physical Activity 2018–2030. The Alliance for Health Promotion (A4HP) considers social mobilization by way of community-based campaigns to be an effective strategy to encourage healthy behaviour by enhancing awareness of benefits of physical activity. Each year since 2015, A4HP uses the yearly Health Promotion Day to bring local together with global to raise awareness of health promotion. The Health Promotion Day was organised in collaboration with WHO this year, during the 71st World Health Assembly (WHA), to encourage participation in the Walk the Talk: The Health for All Challenge from WHA delegates, the UN family and the Geneva community. Health literacy also has an impact of physical activity levels. Although low health literacy is often associated with a lower level of education, according to this study higher income countries have shown the least progress made in physical activity levels. Economic development and urbanization have no doubt impacted physical activity levels but with adequate health knowledge, skills and information, that is increased health literacy, everyone has the opportunity to improve their health. In collaboration with its members, the Alliance for Health Promotion will continue its work of creating active communities and empowering individuals to improve their health knowledge and skills. WHO. Global action plan on physical activity 2018–2030. More active people for a healthier world. Geneva: World Health Organization; 2018. Accordingly, we encourage the Director-General to use his authority to establishing a WHO working group on the Framework Convention on Global Health, or for member states to mandate the same. The working group should include state, civil society, and community participation, and could examine the possibilities of this Convention, including potential benefits, principles, parameters, and ways forward. Now, forty years after Alma-Ata, this could at last secure health for all. Dr Glenn Laverack, Health Promotion Research, University of Southern Denmark. Health Promotion Village, this Sunday, come and join us in Geneva in the Bains des pâquis ! Come and join us for a giant yoga session in the Place des Nations at 12.15 an event initiated and coordinated by Geneva Association for Community Development and the Alliance.